All Black Moon Guitar's Crossroads Series #19 of 20, "Grey-Hound." Hound Dog has always been one of my biggest favorites and influences so here's the tribute, the "Grey-Hound." Kawaii S 180. To my knowledge they came in three color varieties; Sunburst, (red) Wine-burst, and Tobacco-burst. I've never seen a picture of him playing anything but a red one although the cover picture for "Live At Joe's" seems like a sunburst. I've never seen him playing a "tobacco." Hound Dog would probably laugh at all the Teisco's for sale now claiming to be his model. There we're two models he is pictured with in his glory years and this is the most desirable. It seems that when getting one of these cheapo guitars Hound Dog would always reach for the red one. The sunburst's and the wine's are hard to come by but the stock of tobacco's are much more plentiful. To get micro on HDT model guitars in terms of collectability/desirability its the red S180. Maybe I'm FOS. Offset guitars are for wimps and emo's? This one smashed the hell out of that newish stereotype and pretty much transcends it. In my opinion this model is in the top 3 best affordable Japanese guitars in terms of tone and looks. 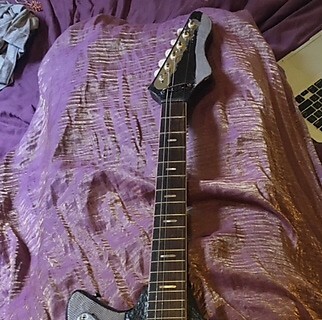 The third one I've owned, it was purchased on Reverb around x-mas as a present to myself because I have too many guitars to actually have (room for) a girlfriend. The seller was a nice guy who told me the wiring he been re-done and the neck was strait but a little high at the 12th fret. 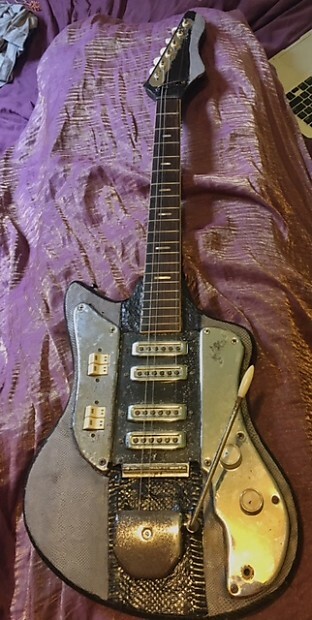 Buying old cheap guitars online is such a gamble that its something I rarely do anymore. 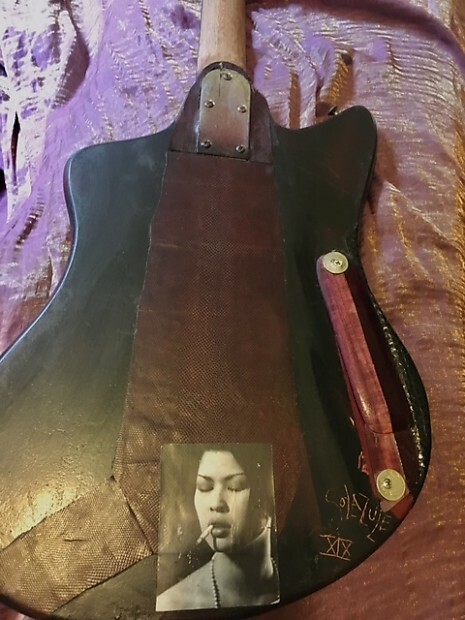 I should have sent it back, the wiring was in need of some help and the neck had a little hump around 4,5,6 with frets 1,2,3 being leveled by an amateur whose skills are worse than mine. I'm still scratching my head on that one. Not a big hump and not a "fretless" level, pretty slight. 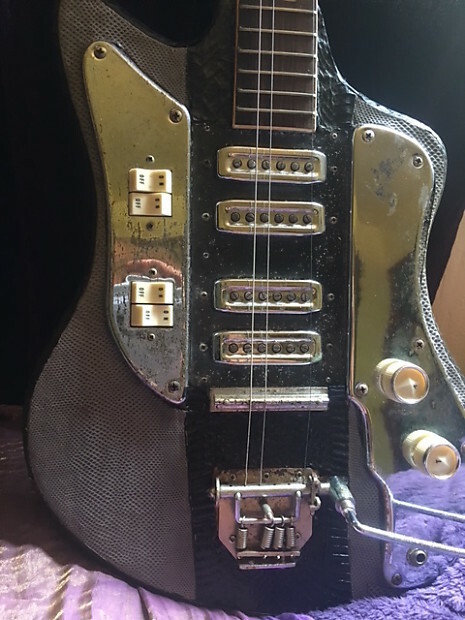 It now has a serviceable nut and I've been working with different bridges and feel I've cracked through to make it playable in the way it was described when I bought it and Hound Dog approved for finger and slide. And he had a mouth on him. I gave the guy 4 star feedback because he was younger, seemed genuine and likable. Maybe the wiring issues happened during shipping? It came with one of the mounting plate hooks off the low E tuner broken, but the peg was included, these are really hard to come by- both will come with the guitar. I play a lot of 5 string open G like Kieth so I didn't care that it was missing a peg. I fixed the wiring, so thats tight, the bridge is next- about an hours work. Considering I've put around 20 hours into this girl already I need a break but it will arrive with playability and action that Hound Dog would approve of- and he had a mouth on him. There is great pitting on all the chrome which I like a lot but the paint was perfect, very incongruent, almost like someone swapped the chrome with a beat red one. Ok, so I wanted to see it black and decided to cover the top in electrical tape (Hey its an electric guitar...) Looked pretty good black. 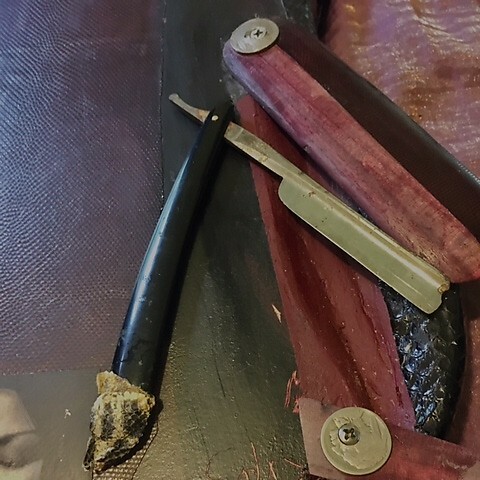 Then I opened the skin box and cut some grey dyed karung snake which looked cool by rock and roll standards represents transformation if you want to talk "crossroads", philosophical, jungian blah blah. Snake skin and lots of poly usually get along pretty well but the poly turned the grey a little blotchy so I added another layer and bushed on a lighter coat. Black python goes through the center. Thats when the Grey-Hound lightbulb came on. On the back I sanded then sprayed a coat of wine colored paint and then sprayed some black letting the coat beneath bleed through a bit an added a strip of burgundy karung. 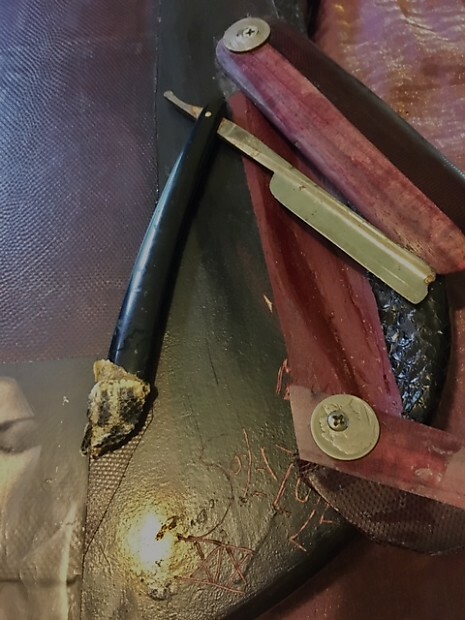 Then I cut out a smugglers cavity to fit a (very sharp) black strait razor. Hound Dog got drunk and cut off his 12th finger with a strait razor leaving him with 11. I also put blades in some of my crossroads guitars in recognition of how F****** dangerous it was being a bluesman in the 20th century. Even the guys playing on the street in New Orleans would try to find a bar in the French Quarter that would hold their guitars for them overnight so they didn't get jumped/robbed on the way home. And this was in 1995. Imagine 1935??? Two pieces of purple heart cover the cavity to honor combat vets and a couple of buffalo nickels as washers, one bent to avoid snags and provide maximum hip comfort. I put on a Wilkinsen tuner on the in the low E slot but only play it with 3 strings currently- ADD, not a Seasick Steve thing, this is an awesome tuning I've been playing 20 years, Basically open D with the strings taken out that get in the way. Highly encourage anyone to try it but It will come with 6 new strings on it. The trem bar is original and actually works. The bar is one of those hinky threadless jobs that was was missing a part. Fixed buy wrapping the bottom in clear two-sided adhesive tape. Works great, Ill throw some extra in the case. Its a solid Mickey-Mouse job. 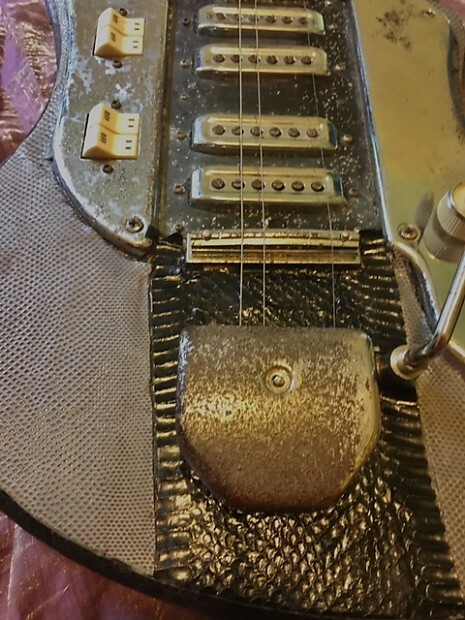 Its hard to beat the tone that 4 of these low output pickups put out. Hound dog dailed his in with a cranked Super Reverb, I like my Rat distortion pedal because of my ears, age and the neighbors. They deliver everything they promise to. This guitar actually comes with a case which is almost unheard of- a new Blade hard/soft bass case with a few crude modes inside. $100 case curtiousy of Trevor Boone of ECG in Seattle- Karma can be a good thing. Mahalo bro! 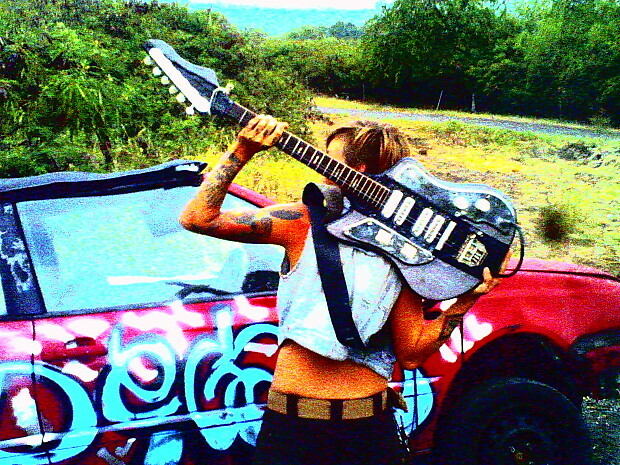 This guitar is not a wallhanger, it is made-to-be-played , beaten and abused like all my others, please check them out. I will still pack this for war like all my other guitars. I have a no return policy unless the guitar arrives as otherwise pictured or descibed. If my excessive description bothers you please take it with a grain of salt. I'm passionate about this stuff and it beats a couple of sentences and a WTF? when your guitar arrives "as described." Please check out my 100% feedback as a member of ebay since 2002, mckeef7.